The CD came with a standard jewel case, with a back cover and a sticker with early dates of the US tour. That sticker was probably to be also found with the album release since it has the album’s catalogue number. 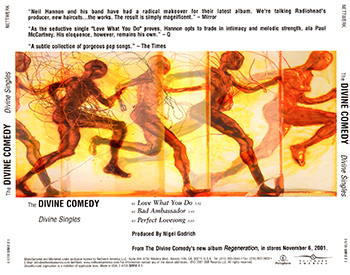 The back cover features some press reviews from the UK press, an edit of the album cover picture, a tracklisting plus a credit to Nigel Godrich, the release date of the album. Logo of both Parlophone and Nettwerk are printed, next to Nettwerk’s contact information, copyright notes and the sampler’s catalogue number. The same number is also to be found on the spine of the cover.